So you have been sold a Managed Services contract and everything seems perfect on the surface until you notice that system and application performance is poor, your calls are not being returned, you engage with resources with little or no knowledge of your environment and problems keep recurring. Does this sound all too familiar? The number of business owners that have engaged with us here at ERS IT Solutions for Managed Services has increased dramatically over the past 24 months. The main driver of this trend is poor service delivery by their current IT partner fuelled by a distinct deficit in IT skills/expertise and a lack of qualified resources. 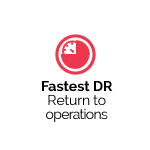 Many of these IT providers operate using a ‘low cost/high churn model’ with little or no interest in long-term relationships or even in the real wellbeing of the customer’s IT environment which is why their services were sought in the first place. In hard times, it is understandable that companies will gravitate towards lower prices and these initial proposals will sound incredibly attractive. You will have been told you are getting a Managed Services contract and everything will seem perfect on the surface so why should you be worried. Price is only one element of the overall package you are purchasing. As the old adage says, ‘If you pay peanuts, you get monkeys’, and that goes for these support packages that mask themselves as Managed Services. The tell-tale signs are all too familiar and will manifest themselves very early in the relationship. 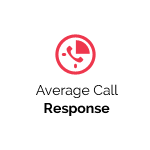 Your logged calls take hours (if not days) to elicit a response. When a response arrives, the problem is addressed, only to resurface all too soon. You never seem to be able to talk to the same IT resource and consequently they never have a full picture of your IT environment. Performance issues affecting applications and systems seem to be constantly present with no definitive answers being given and it’s always some other third party getting the blame. The bad news is that this low cost package that looked attractive initially is actually costing your business money in lost productivity and inefficient or unsuitable IT advice and infrastructure choices. The truth it that Managed IT Services is a collection of distinct services that can only be provided by suitably qualified personnel. There’s a lot more to Managed Services than merely forwarding an electronic report to a customer every month with meaningless statistical information. Managed Services means proactively monitoring a customer’s IT infrastructure and solving any problems before they affect the customer’s IT experience. It means taking preventative action to stop any issues occurring before they disrupt the customer’s IT experience and affect productivity. It means finding out why IT problems occur and solving them in a way that they will never happen again. It’s about proactively monitoring a customer’s IT infrastructure and reacting to solve problems before they impact the environment or user. It’s about taking preventative measures within the customers IT infrastructure to prevent issues occurring in the first place minimising user disruption and improving business efficiency. It’s about getting to the root of all IT problems and solving them in a manner which ensures they will not occur again. 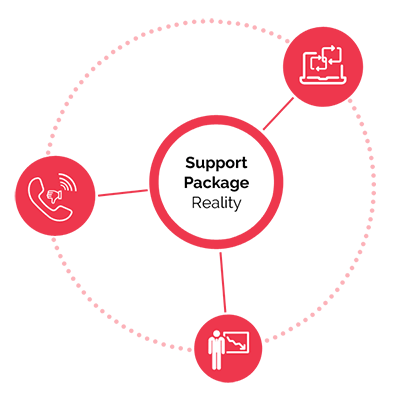 Managed Services can only be performed adequately by a company which has fully qualified and highly capable staff who are dedicated to providing first-class customer service. At ERS IT Solutions, we tick those boxes. Our team of IT specialists will provide customers with end-to-end IT managed services and solutions, and our service delivery model that sets us apart from other IT managed service providers. The first step in delivering a professional Managed Service to any business is the on-boarding process and site audit. 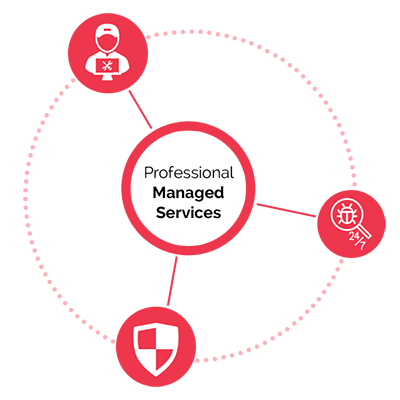 This entails a comprehensive review of the customer’s IT environment to identify any security risks, vulnerabilities or faults that require urgent corrective attention. The aim is to bring the customer’s environment up to requisite safety standards where all systems are fully patched and configured with our managed agent tools, which also automatically perform multiple software updates to minimise disruption to the customer’s IT usage. This may not seem especially important but this step will greatly reduce the amount of interruption from software updates, leading to improved productivity and an all-round enhanced customer experience. 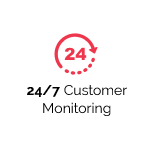 As part of a Managed Services package from ERS IT Solutions, we monitor multiple aspects of the customer’s IT environment, including service threshold levels that check unusual activity across memory, disk storage, CPU usage and temperature. 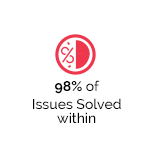 This allows our team to react swiftly to identify the root cause of any problems and take remedial action before the customer ever knows that there was an issue. This greatly reduces business disruption for the customer and can provide massive gains in productivity. At ERS IT Solutions, this is what we call Professional Managed Services. 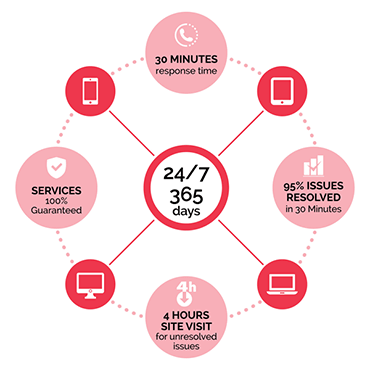 We are fully dedicated to resolving our customers’ IT problems in the least amount of time and our services are based on an agreed Service Level Agreement where we guarantee that we will fix the problem within a specified amount of time or else you get your money back. Contact one of our Technical Support Specialists now to discuss how our Managed IT Services can transform your business.